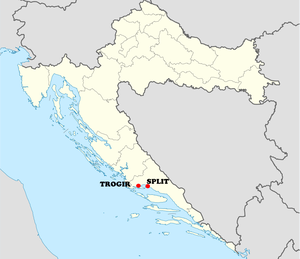 The tour starts with a 30 min coastal drive to the UNESCO Island town of Trogir, where you’ll walk the cobbled streets, squares, seaside promenade and see the 13th century cathedral of St. Lawrence, the 16th century Venetian Kamerlengo fort, medieval Renaissance palaces, local limestone houses and more. After experiencing Trogir and hearing about the local history, customs and trivialities you’ll go back to Split for a full walking tour of Diocletian’s Palace and the rest of the medieval part known as the ‘Old Town’. After the tour you’ll have free time to explore on your own, do some shopping and indulge in the local cuisine. Meeting point:If you’re arriving by cruise liner your guide will be waiting for you in front or your ship or tender with your name on a sign. Tour includes: Expert local licensed guide, air-conditioned transport & parking tolls.